Sometimes it’s okay to blow your own trumpet! This is how Michael Starrett, Chief Executive of the Heritage Council, summed up KCM when presenting us with the Museum of the Year Award in 2009. This was the culmination of over 15 years hard work and planning. Our first success came in 1994 when we were short-listed as one of the selected candidates for that year’s European Museum of the Year Awards; in 1995 and 1997 we followed this up with commendations in the Best Smaller Museum Category. 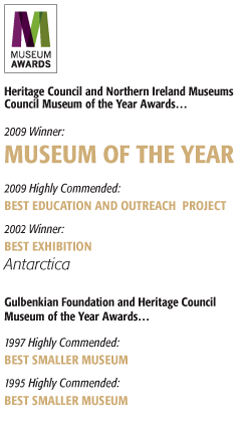 In 2002 we won the Best Exhibition Award at the Museum of the Year Awards for the ‘Antarctica’ exhibition, displaying the life of Tom Crean. KCM was praised by the judges for the imaginative and striking design, and the judges felt that the presentation, design, the success in raising the profile of a local hero, the links with surviving relatives (which ensured the protection of important artefacts) and broader contextualisation of Crean’s achievements made Kerry County Museum a model and worthy winner.